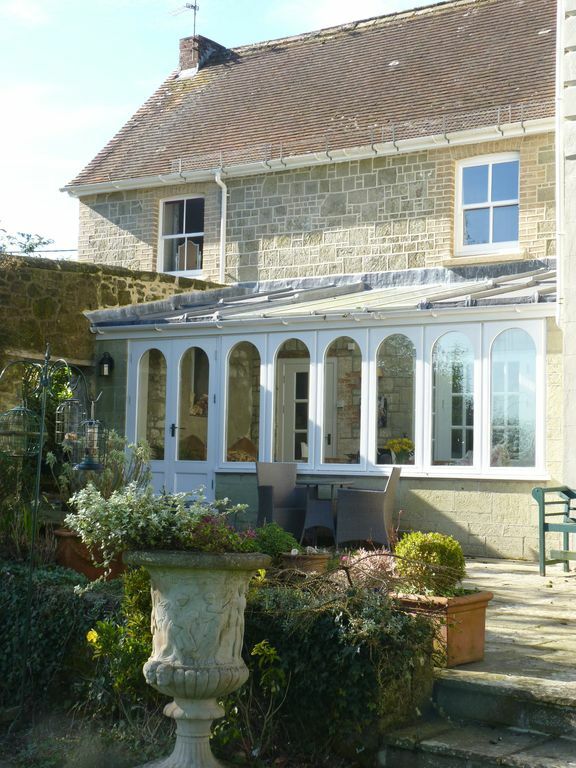 This is a fully restored Victorian cottage in a conservation area in the street at the bottom of Shaftesbury's famous Gold Hill with a beautiful conservatory that overlooks an acre of garden yet is only ten minutes walk from the centre of town. There is a spacious lounge, well equipped kitchen with dining table and a utility room off it with dishwasher, washing machine, freezer and tumble drier. There is a downstairs toilet. Upstairs the two bedrooms are large and both have lovely views. There is a bathroom with a bath and shower over it. There is a desk for a computer and full wi fi. In the garden there is a summer house with a beautiful vista, a trampoline, table tennis and badminton if requested. You can sit out on the patio if weather permits! As the tourist guides will tell you, there is plenty to explore in and around the town. Days out at the coast are possible as well as amazing cycling and walking possibilities. History is everywhere and we have all the relevant information to help you plan your visit before or during your stay! We look forward to welcoming you. What a perfect place to stay. We found Hillary to be a very friendly and helpful host. Chantry Cottage had all modern amenities but with a feel of old world charm topped off with a beautiful garden to wander around. The views from both bedrooms look across to Melbury Hill. We will return...and hopefully very soon. A really lovely spacious house for a family of 4 with a beautiful garden. Had everything you needed for a short or long stay. Would recommend to anyone and Hilary was lovely and was only next door or a text away if you needed anything. A really great place from which to explore Shaftesbury & surrounding area & feel sure we'll be paying a return visit some time. Hilary is so welcoming & has an AMAZING file of info for guests. Beautiful garden & conservatory from which to view it. Short walk into town & we had an excellent Indian meal in "Chutney" one evening. Lovely holiday, location and property excellent! Would stay again, enjoyed the garden, proximity to town and property. A lovely house that was extremely easy to stay in. I would normally stay in a detached house with a private garden; but Hilary was such a helpful but unobtrusive neighbour, and the shared garden so huge and lovely, that I would not hesitate to stay again. The house is very well equipped, light and clean. I fully recommend it.